Bandits have entered in the town with evil designs. 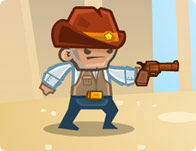 Pick up your gun and kill all of the bad people to save the town. Buy upgrades like armor, gun and luck to increase your chances of victory. Use mouse to aim and shoot and click the barrel to reload.